Mahesh provides the strategic leadership as the Director for Meinhardt’s India façade consultancy business. He has been in the façade industry for over 22 years. His experience ranges from aluminium glazing systems to precast concrete facades, BIPV, BILED, Enhanced systems and stone cladding. Mahesh has been involved in the façade works for numerous prestigious projects in Far East Region, Middle East and India. 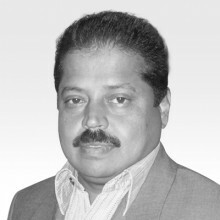 Over the years, Mahesh has fulfilled roles in design, procurement and management of faced works. This diverse background offers tremendous advantages in his position with Meinhardt Façade Technology. At Meinhardt, Mahesh has acquired experience in various aspects of façade design, including curtain walls, glass walls, aluminium and stone claddings, canopies and skylights. Curtain wall and cladding system design. Glass manufacturer quality control and testing. Tension structure manufacture, site installation. Glass wall system design. Stone cladding system designs. Defects investigation and rectification . Pre-cast concrete. Building Maintenance Units. Building Integrated Photovoltaic Systems (BIPV). Building Integrated LED/Lighting. Enhanced Systems in Aluminium (Security, Fire, Heat and Smoke).